Covington is located at 47°21′57″N, 122°6′1″W (47.365780, -122.100213). According to the United States Census Bureau, the city has a total area of 5.8 square miles (15.0 km²), of which, 5.8 square miles (14.9 km²) of it is land and 0.04 square miles (0.1 km²) of it (0.69%) is water. The current population is around 17,190 people. As of the 2000 census, there were 13,783 people, 4,398 households, and 3,689 families residing in the city. The population density was 2,389.8 people per square mile (922.3/km²). There were 4,473 housing units at an average density of 775.5/sq mi (299.3/km²). The racial makeup of the city was 87.88% White, 2.44% African American, 1.02% Native American, 3.12% Asian, 0.22% Pacific Islander, 1.80% from other races, and 3.53% from two or more races. Hispanic or Latino of any race were 4.48% of the population. There were 4,398 households out of which 52.2% had children under the age of 18 living with them, 70.1% were married couples living together, 9.7% had a female householder with no husband present, and 16.1% were non-families. 11.4% of all households were made up of individuals and 1.7% had someone living alone who was 65 years of age or older. The average household size was 3.13 and the average family size was 3.37. In the city the population was spread out with 33.8% under the age of 18, 7.0% from 18 to 24, 36.2% from 25 to 44, 19.3% from 45 to 64, and 3.7% who were 65 years of age or older. The median age was 32 years. For every 100 females there were 103.3 males. For every 100 females age 18 and over, there were 100.2 males. Covington is a new city but the history and spirit of the Covington area extends back over 100 years. The original Covington area was called Jenkins Prairie and was used as an annual gathering place for the Indians. The name continues with Jenkins Creek, there is even a Jenkins Creek Elementary School. In the 1880's the Northern Pacific Railroad commissioned a surveyor by the name of Covington to develop a railroad line between Auburn and Kanasket. Along the way a stop was named for him and a community was born. In 1890 the Covington Lumber Company was formed at the junction of Soos Creek and the Northern Pacific Railway just southwest of the Covington depot. A dam thirty feet high was built to create a logpond. Even back then the Game Department required that they put a fish ladder in for the salmon. The lumber mill could produce 6,000 board feet of lumber per hour and also housed a shingle factory. 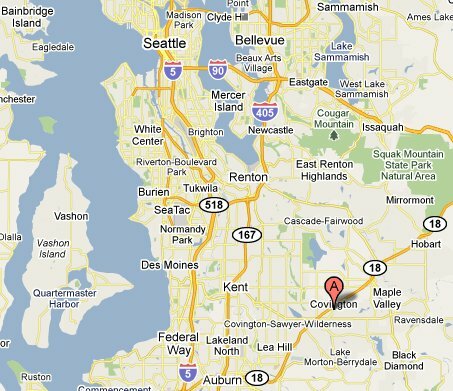 The company and mill town of Covington were located about four miles southwest of what is now QFC. An abundance of timber and water in the area soon lured other lumbermen to be build in Covington. Charlie Meredith built a mill on Jenkins Creek just north of the whistle stop and the Award Lumber Company was located about three miles east of Auburn. One of the best known mills in the area was started by three partners and was named the Covington Creek Mill. Services were soon to follow and by the 1900's the area had a school, store, post office, loan office, feed mill and fire station. The cooperative store, Granger's Co-Op, was formed because of high prices and a feud with Kent merchants. A cemetery was started around the same time, Meridian Cemetery, and the land was purchased for $5 per acre. Phone service was introduced to Covington by this time as well. The cost was $12.00 per year for the "Farmers Party Line" and a refund was offered each year if there was little or no trouble on the lines. A Covington telephone directory was printed as early as 1911. After the trees were logged off, the "Soos Creek stump ranchers" arrived to work the land. They cleared the stumps and brush turning the area into valuable dairy pastures. In 1937 Covington had it's own school district number 138. It was housed in a building on the Kent-Black Diamond Road. On school days you could hear the school bell ring for miles. When the building burned down the bell was refurbished and donated to Covington Elementary School on Wax Road. It is still there today. The area has continued to grow with neighborhoods of single housing units giving it a unique family atmosphere. An additional 5,000 family units are expected to be built in the area in the next 20 years. Covington was built by the type of hard working, caring people that we still have here today. And as history has continued to show, so has the strong community spirit. As one community resident put it "Covington... a touch of America". Covington was officially incorporated as a city on August 31, 1997. In 2006, new Covington downtown businesses included a new Wal-Mart, a Kohls, a Carl's Jr, an Applebees. 2008 brought the newly opened Red Robin, Cutter's Point, and Home Depot in the new shopping center next to Jenkins Creek Elementary School. Fast growth is expected to continue in the area due to the continued widening and modifications done on State Route 18. New businesses arriving in 2008 include a Costco behind the Fred Meyer.